The Kiwi Coast is an collaborative initiative that links over 120 community-led conservation projects, iwi and hapu, schools, forestry companies, government agencies and organisations in the shared vision of restoring the health of our native forests, helping native wildlife thrive and increasing Northland kiwi numbers. The vision of Kiwi Coast is one of thriving kiwi, safely roaming throughout Northland, nurtured and cared for by Northlanders. We are creating New Zealand’s first modern day kiwi corridor. Thousands of animal pests are removed from the Kiwi Coast every year by all the groups and project involved making our forests healthier and our native wildlife safer. Unlike other parts of New Zealand, kiwi are on the increase on the Kiwi Coast thanks to the hard work of everyone involved. Trap catch data collated across all the groups and projects show that 297,753 animal pests were removed from the Kiwi Coast between 2013 – 2018. In 2018, 68,756 animal pests were destroyed on the Kiwi Coast – that’s over 1,000 pests per week! To participate in the Kiwi Coast Shared Animal Pest Control Results simply fill in this form in January each year. In many parts of New Zealand, kiwi continue to decline unless they are behind predator proof fences, on offshore islands, or within fiercely defended ‘sanctuaries’. In Northland it is a different story. Here, some managed populations of the Northland brown kiwi are not only stable, but actually increasing. This is largely due to the efforts of community-led conservation projects, working in partnership with government agencies, other organisations and private landowners to carry out predator control, release kiwi back into the wild and advocate for responsible dog control. Now that some initiatives have successfully ‘saved’ the kiwi in their locality, a new opportunity has arisen. Juvenile kiwi are on the move out of intensively trapped areas into unsafe territory. Kiwi are not surviving outside of the protected areas. There is an increasing sense of urgency from landowners that something must be done. The concept of a kiwi corridor along the eastern coastline of Whangarei has steadily gained momentum over recent years, to the point where it has developed into a shared vision called the Kiwi Coast. While the focus of Kiwi Coast is on kiwi, noticeably, there has also been a multiplier effect. Once groups gain confidence and skills from kiwi recovery based pest control and monitoring, they quickly turn their attention to other biodiversity restoration goals. While kiwi often remain the iconic goal, groups are also involved in a multitude of other activities such as pateke recovery, forest health, weed control, kauri dieback prevention, reintroductions of threatened species such as robins, forest fencing and riparian planting, etc. The ‘can-do’, action-on-the-ground, community led style of the Kiwi Coast has engaged the hearts and minds of many Northlanders, inspiring and motivating more and more communities and hapu to get involved and look after “their patch” and “their kiwi”. 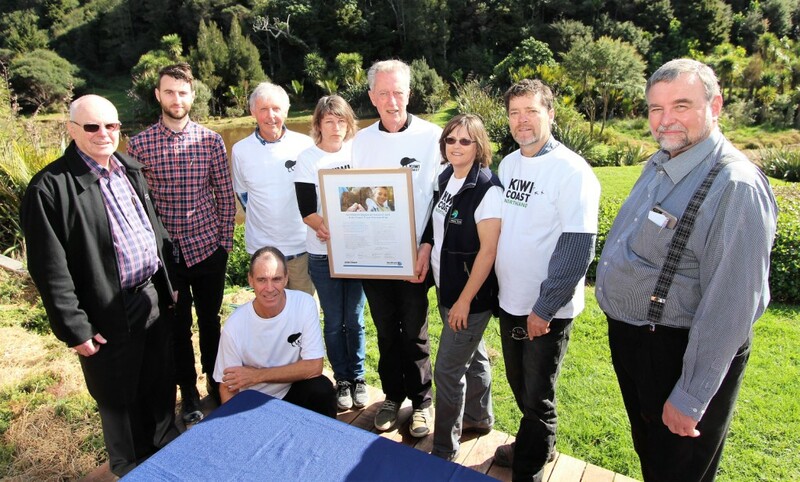 The Kiwi Coast recognises the considerable community-led conservation work already being undertaken in Northland. Working together under a broad, shared vision, the Kiwi Coast aims to multiply the effectiveness of existing efforts and maximise conservation gains. in Northland as a taonga. reduction and good dog control. and nurture kiwi for future generations. Over the last 20 years agencies and organisations including the NZ Landcare Trust, Northland Regional Council, QEII National Trust, Department of Conservation and Kiwis for Kiwi Trust have strongly supported and championed community and hapu led pest control and kiwi recovery in Northland. The Kiwi Coast has emerged from this strong foundation, taking the next step of linking individual projects to create continuous trapping networks and operate at a landscape scale unrivalled in New Zealand. In 2013, Kiwi Coast partnered with the Reconnecting Northland Programme (RN) and became it’s first pilot project. Support from RN Delivery Partners WWF-NZ and NZ Landcare Trust and funding from the Tindall Foundation and Foundation North provided a firm base of support over the first four years of Kiwi Coast. funding and implement a strategically coordinated regional approach.